Use this resource to find descriptions and full-text reviews of published tests. This database will provide test reviews and information indexed from education related journal articles, books, and more. ERIC: the Educational Resource Information Center, is a national information system supported by the U.S. Department of Education, the National Library of Education, and the Office of Educational Research and Improvement. It provides access to information from journals included in the Current Index of Journals in Education and Resources in Education Index. This version provides access to the full text of articles from more than 540 journals indexed in ERIC plus the full text of more than 2,200 ERIC Digests along with references for additional information and citations and abstracts from over 1,000 educational and education-related journals. To locate journal articles on assessment tools for special populations, use research databases available from the Education Library Guide. 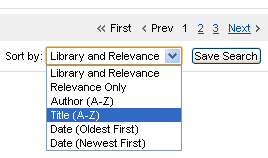 To locate books for background information, use the Ely Library QuickSearch. This may lead you to the Stack, Reference Collection, or ERC. NOTE: Tests do not normally circulate outside of the Library due to the cost of replacement. They are like Reserve Items. You must sign out each test before using it. In the main search box, type in SU:ERC Tests. Click on "Go"
From your search results, select the test you need and print the record out with call number. Enter the ERC area and ask for help at the service desk to retrieve the test. This is not a self-service collection! Make sure you request all the parts you need to work with. You will be asked to sign out the test to use in the Library, just as you would any Reserve material. Please return tests to the ERC Service desk before leaving the library and make sure all parts are included. Select Special Education from the list that appears to see related films.